• Small footprint (13 1/2” x 17 2/11”) fits into tight counter space. • 120V/60Hz or 230V/50Hz equipment with high output. • Insulated and air cooled. • Self-dispensing bread drawer slides forward for removal of product. 1440 bagel halves per hour! The X-TRM-3H 13” Wide Radiant Conveyor Toaster provides a 13” wide “X-treme” wide opening to allow 3 slices of toast to pass at one time. Designed to produce toast (3 slices across) in less than 30 seconds, for more than 800 slices of toast per hour! Variable speed controls combined with top and bottom heat controls give you “X-treme” versatility to handle all types of breads, bagels or muffins. Super feeder and power saver stand-by control are standard. Thermostatically controlled fan combined with high temperature insulation provide the maximum safety for your employees. The X-TRM-2 10” Wide Radiant Conveyor Toaster incorporates all of the technologically advanced features of the industry’s leading toaster line and combines it with the new stylized “X-Treme” exterior. 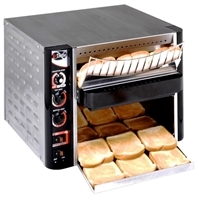 Produce toast in less than 30 seconds, for more than 800 slices of toast per hour! Variable speed controls combined with top and bottom heat controls give you “X-treme” versatility to handle all types of breads, muffins or bagels. Super feeder and power saver stand-by control are standard. Thermostatically controlled fan combined with high temperature insulation provide the maximum safety for your employees. Commercial Toaster, medium-duty, (4) extra wide 1-3/8" slots, (4) slice capacity, electronic browning controls, removable crumb tray, brushed chrome steel, 6 ft. cord with 3-prong plug, 120v, 60Hz, NSF, UL & CUL listed. 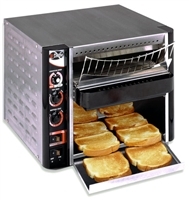 Heavy-Duty Commercial Toaster, pop-up, 11-7/8"W x 10-1/2"D x 9"H, (4) slice capacity, (300) slices per hour, (4) 1-1/8" slots, electronic browning controls & carrige control levers, replaceable industrial heating plates, removable crumb tray, brushed stainless steel housing, NEMA 5-20P, 2200 watts, 18.33 amps, 120v/50/60/1-ph, cETLus, NSF.